When it comes to cooking, Mama Lin has taught me many things: how to pleat potstickers like a pro, how not to overcook my bok choy (she’s particularly picky about this), and how to peel an orange in less than 15 seconds. The most valuable lesson she’s taught me, though, is to be resourceful with my food. If you’ve ever met Mama Lin, you’ll know that she hates food waste. She saves the bones from a feast for soup broth; she dries pomelo skins to concoct a tasty herbal tea. Now that I’ve become my own cook at home, I’ve tried to adopt these lessons about being resourceful with food to my own cooking. That’s why I’m partnering with Earthbound Farm today to celebrate Earth Month and to show how to make the most out of the food we buy. A lot of you may know this already, but food waste is a big problem in the U.S. I’ve read reports from the USDA that food waste amounts to 30 to 40 percent of our food supply! It boggles my mind that we’re spending so much time and resources to food that doesn’t end up being consumed. That’s why I want to share a few creative recipe ideas to make the most out of our food and to do our part to limit the amount of food we throw away. I love buying bunches of carrots at the farmers market, particularly because they come with those beautiful green tops. I know a lot of people (including my sister—tsk, tsk) who toss those greens away, but they’re great in an herb soup or a pesto sauce! Besides flavoring pasta dishes, the carrot top pesto is amazing on top of a pizza, too. Aside from carrot tops, I’ve also included a handful of salad greens in this pesto. If you’re like me, you’ll open a package of salad greens in the beginning of the week, only to forget about it for days. By the time you dig out that package from the back corner of your fridge, you realize that the greens look less than optimal for a salad. Instead of just tossing them away, throw them into a green sauce or sauté them with other vegetables. They’ll add an extra bit of nutrition to whatever you’re eating. Let’s do our part to try to lower the amount of food waste by making simple changes to the way we cook. Every bit of our efforts can add up to make a big, positive impact to our food systems, and, ultimately, our earth. To get more tips on how to make more earth-friendly food choices, visit Earthbound Farm’s website and take their “How green is your cart?” quiz! For every quiz taken, Earthbound Farm will plant a tree (up to 20,000)! Isn’t that cool? Also, at the end of the quiz, you’ll get a $1 coupon that can apply to any Earthbound Farm product. Be sure to check it out! Did you say miso in the ingredients? Yes! 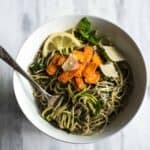 I love adding miso to my pesto sauces because it adds an umami flavor. If you don’t have any around, leave it out and just add salt. Rinse carrot tops thoroughly: A lot of dirt gets trapped in carrot tops, so be sure to rinse them thoroughly! Refrigerating the Pesto: The pesto does start to turn brown at the top after a day. Just give the sauce a quick stir before using it, and it should look green again. 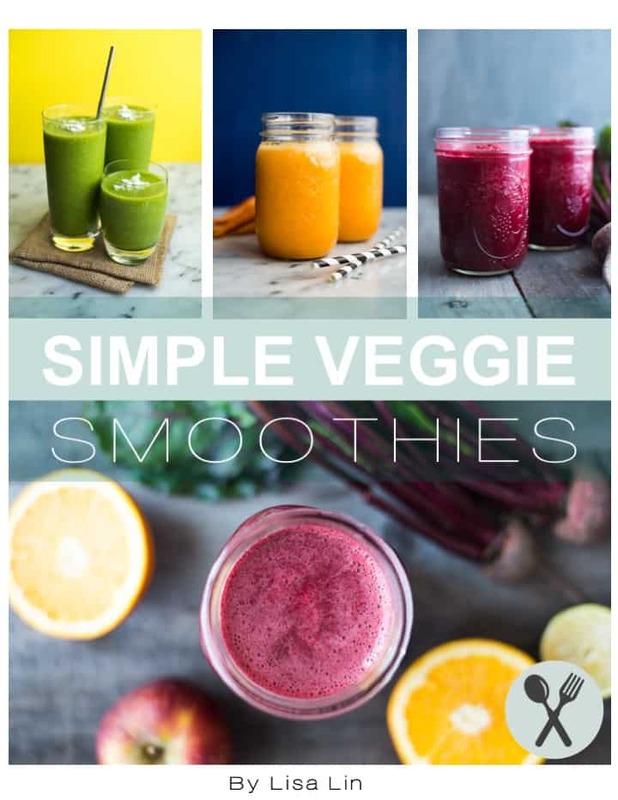 If you try this recipe, let me know how it goes by leaving a comment or sending me a message. Take a photo of the food and tag me on Instagram so that I can give you a fist bump. Seeing your creations makes my day! Preheat oven to 425 degrees F. Line a baking sheet with a silicone mat. Peel carrots and slice them thinly on the diagonal. In a bowl, toss sliced carrots with a 1/2 tablespoon of olive oil and a pinch of salt. Spread carrots on baking sheet and bake for 15 minutes, stirring after 10 minutes of baking. Remove from oven to cool. In a pot, bring a quart of water to boil and add a generous pinch of salt. Add pasta and cook for 7 to 8 minutes. Rinse under cold water and set aside. Rinse carrot tops thoroughly. In a food processor, blend all the carrot top pesto ingredients together. Taste to see if you need to add more salt. 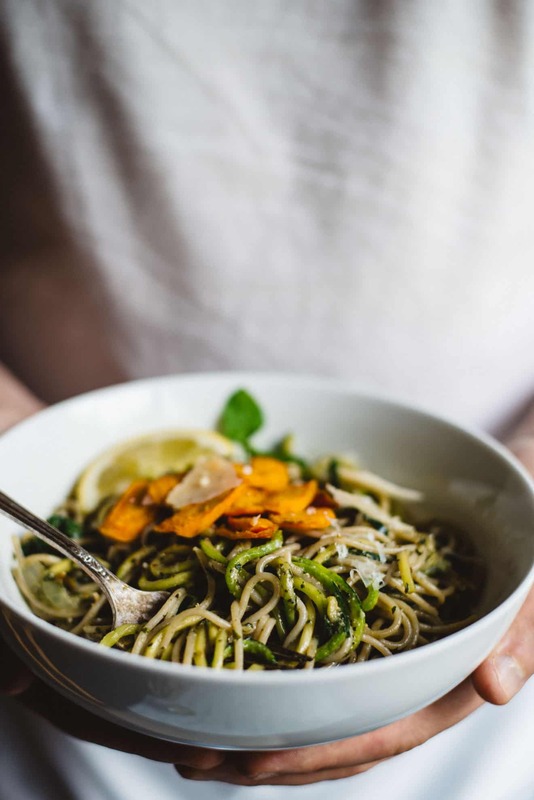 Trim ends of zucchini and cut into noodles using a vegetable spiralizer or a julienne peeler. Set aside. Heat 1 tablespoon of olive oil in a large sauté pan over medium heat. Add onions and cook until they soften, about 2 to 3 minutes. Add zucchini and cook for about 2 minutes. Turn off heat. Add pasta to pan and toss everything with 1/2 the pesto sauce. Feel free to add more sauce, if you like. Refrigerate remaining sauce for 1 to 2 days. Top pasta with roasted carrots, parmesan, pepper, and a bit of lemon juice. 1. I like using 1 tablespoon of miso paste in my pesto, but you can replace that with 1/2 to 1 teaspoon of kosher salt. 2. Be sure to rinse the carrot tops thoroughly! I lot of dirt can get stuck in there! Mama Lin sounds like she’s full of an endless supply of wisdom. 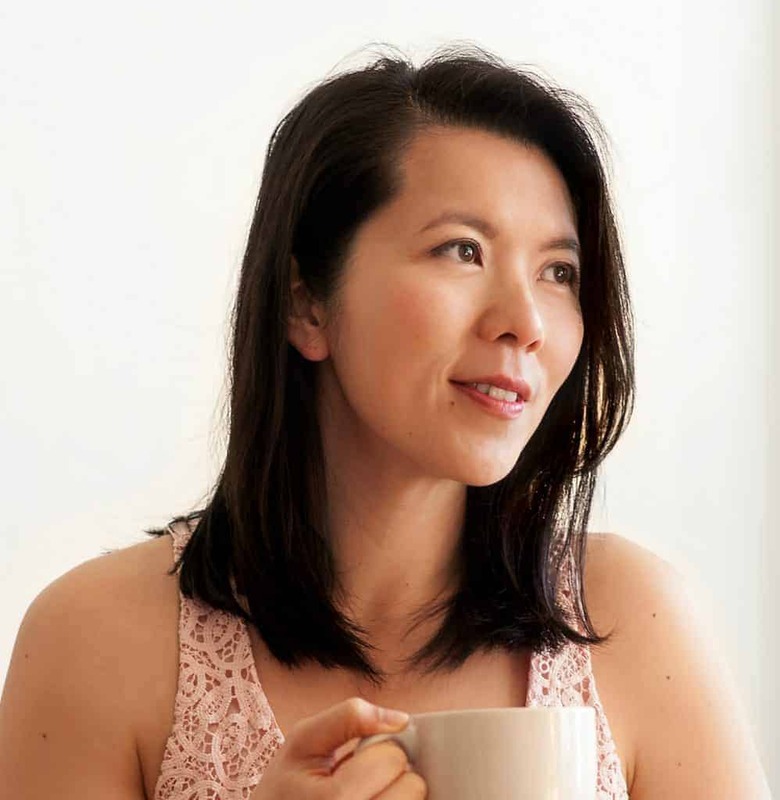 I grew up in a household where heads of lettuce and tomatoes would go bad in the refrigerator because we simply forgot about their existence, so it’s amazing that Mama Lin taught you how to be mindful of what you consume. I’m LOVING this pasta! 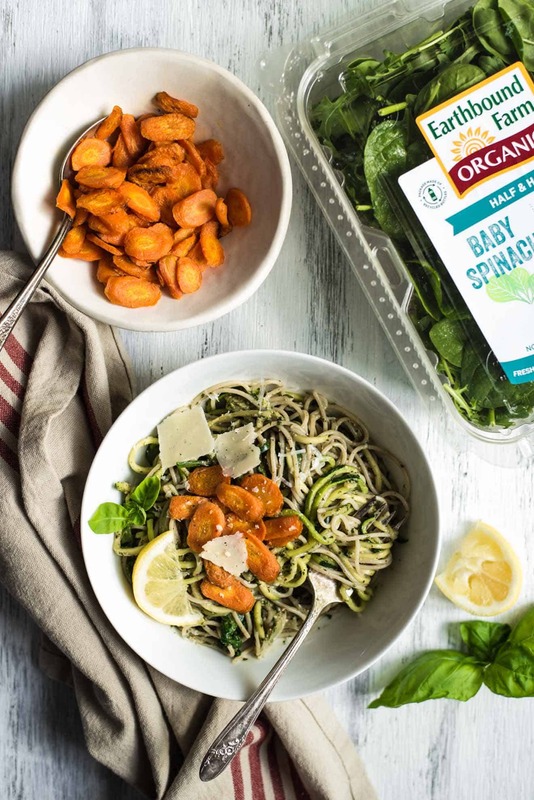 I didn’t realize you could make pesto out of carrot tops, but it makes complete sense. So nutritious, resourceful, and healthy. I’ll have to make this asap! Thanks, girl! Mama Lin is definitely full of nuggets of wisdom! What a good idea using the carrot tops! This looks so wholesome and delicious! I would love to buy carrots so fresh I could use the green tops. Ahh, how much I miss farmer’s markets! Just not the same here in Asia. I can’t wait to be home and have all that farmer’s market produce this summer. I know what you mean, Michelle! I definitely missed a lot of my farmers market produce when I lived in China! You definitely need to get your farmers market fix when you’re out here! 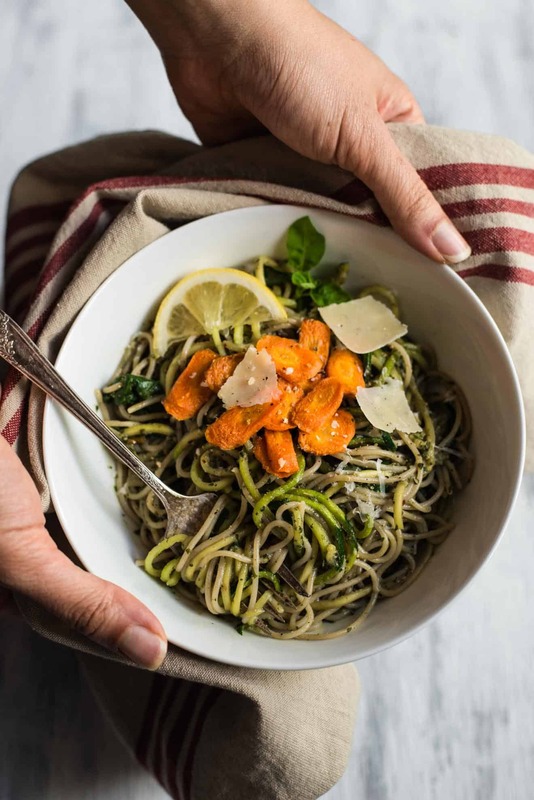 Isn’t it awesome how the spiralizer just encourages us to eat more veggies! Love that you’re family is hooked! Neat! I had no idea you could eat the tops of carrots! This sounds really delicious! I am totally guilty of throwing those carrot tops away…eek! I am saving them next time and definitely going to try this pesto, it looks SO good! Typically compost my carrot tops or give them back to the farm for the chickens to have their way with them. Thank you for reminding me that there *is a better way! I’m certain their packed with nutritional goodness my body would love! That spinach/arugula mix is fabulous! What a delicious pesto and pasta recipe, Lisa. The idea of putting Miso in the pasta is sooo good and I totally see how it would amp up the umami! Thanks, Traci! You know, I’ve been wanting to compost my food scraps, but there’s just no composting around here, and I have no garden to tend to! 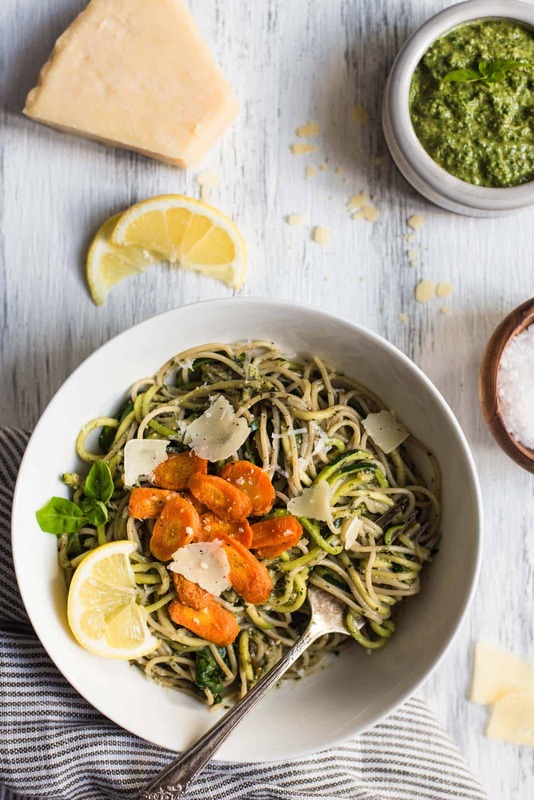 I love the idea of using carrot tops for pesto! I’ve recently pesto based on garlic scrapes and love using it in my sandwiches! Thanks, Michelle! I’ve made pesto with garlic scapes, too, and you’re right, it’s great! I need pleating lessons from you ;)! And man, this sounds amazing. 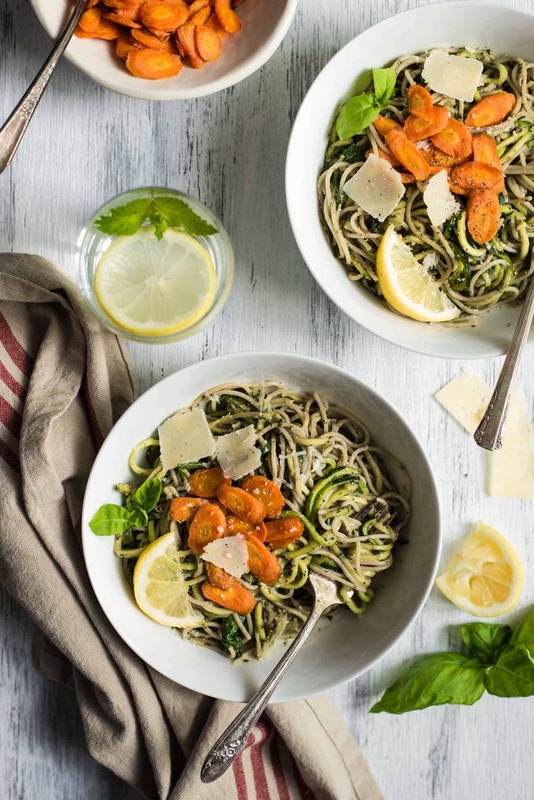 I’ve never cooked with carrot tops before but it makes so much sense–especially in pesto!